A performance by Monte Carlo Philharmonic Orchestra conducted by Gianluigi Gelmetti and featuring Maxim Vengerov on violin. The program includes music by Brahms. 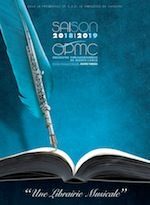 Preceding the concert, at 17:00, a French language introduction to the work by Andre Peyregne, Director of the Conservatoire a Rayonnement Regional de Nice. Free entry for ticket holders.